Located in Western Africa, Cape Verde is an island nation. It has a 965.00 km coastline. The capital of Cape Verde is Praia. This city is located at the top of a chain of plateaus along the southern coastline of the Santiago Island. Praia was officially established as the capital of Cape Verde in 1770, after pirate invasions forced the population out of the previous capital. Today, this city is an important port for this country as well. It has a population of around 154,900, which is significant growth over the 94,1161 individuals reported for the year 2000. These inhabitants can be found throughout a number of neighborhoods, the smallest of which is Quebra Canela. Praia is not the most popular tourist destination in Cape Verde, although it does have a few sites that visitors enjoy. Praia is located in a mild desert climate, which means that very little precipitation falls on an annual basis. In fact, this city only receives an annual average of 8.25 inches of rain each year. Because of its position along the coast, however, the temperatures here remain mild most of the time. Cape Verde is an African country covering 4,033.00 km2. This makes it the 30th smallest country in the world and slightly larger than Rhode Island. Its geographic coordinates are 16 00 N, 24 00 W and Praia is the capital city. The name comes from the Cap-Vert on the Senegalese coast, the westernmost point of Africa. Its ISO code is CV. Cape Verde has a mean elevation of 0 m above sea level. It has a temperate climate with warm, dry summers filled with sporadic precipitation. Its terrain is steep, rugged, rocky, and volcanic. Cape Verde has a population of 553,432 making it the 172nd largest in the world. 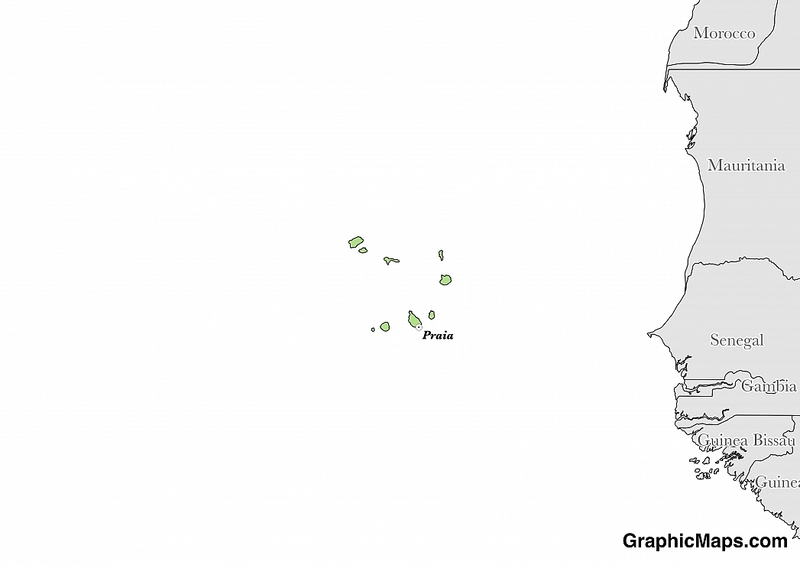 The country's population is not distributed evenly throughout its islands; the southerly islands are the most heavily populated. Portuguese is the official language. The major ethnic groups reported are Creole and African. The population is mostly Roman Catholic with a Protestant minority. The official language of Cape Verde is Portuguese, which is considered a Romance language of the Indo-European language family. Although it is written with the same 26-letter Latin alphabet as English, Portuguese does use some special accent marks to indicate vowel stress, enunciation, and pronunciation. Today, this language is used primarily by government officials and as the language of instruction in public educational institutions. Additionally, it tends to only be spoken at a native level by Portuguese and Brazilian immigrants and residents of this country. The most widely spoken native language in Cape Verde is Kabuverdianu, which is also known as Cape Verdean Creole. This language is considered a language of national identity, although it does not hold official status in the country. The many dialects that make up this language are not considered mutually intelligible. Learning a few Cape Verdean Creole phrases before traveling to Cape Verde is generally considered a good idea. The only minority languages spoken in this country are the dialects of Kabuverdianu, which are dispersed among the various islands making up Cape Verde. One of the least commonly spoken Cape Verdean Creole dialects is Barlavento, which is divided into several variants: Sal, São Nicolau, Boa Vista, Santo Antão, and São Vicente. The dialing code for the country is 238. Cape Verde is an independent country. It gained independence from Portugal in 1975. Its constitution was last ratified in 1992. The government of Cape Verde is carried out under a representative democratic republic, which means the citizens of this country elect officials to represent their interests in government. It is headed by both a President, who acts as the Head of State, and by a Prime Minister, who acts as the Head of Government. Legislative actions are carried out by the National Assembly, which is a unicameral body with 72 members. The judicial branch is administered independently. Citizens of Cape Verde elect the President to serve a 5-year term. The President may serve 2 consecutive terms and a third time, after sitting out 1 term. The Prime Minister is not limited to any number of terms and may serve continuously. Members of the National Assembly are also elected for 5-year terms on the basis of proportional representation. The members of the National Assembly meet in the National Assembly Building, which is located in the capital city Praia. In addition, the President resides at the Presidential Palace in the same city. The majority of the National Assembly members belong to one of two political parties: African Party for the Independence of Cape Verde (52.68%) and Movement for Democracy (42.27%). Factoring in Purchasing Power Parity, Cape Verde's GDP is $3,583,000,000.00 (USD) with $6,700.00 (USD) per capita. This makes it the 179th largest economy and its citizens the 152nd richest in the world. The currency of Cape Verde is the Escudo (CVE). Its major export partner is Australia. Its main exports are fuel, shoes, garments, fish, and hides. Its major import partners are Portugal, Australia, and the Netherlands. Its major imports include foodstuffs, industrial products, and transport equipment. The current flag of Cape Verde was made official in September of 1992. This version of the flag is made up of 5 horizontal stripes: blue, white, red, white, and blue (in that order). Additionally, this flag has a circle of 10, yellow 5-pointed stars. Each of the colors and images on the flag of Cape Verde has a specific meaning. Each of the 10 yellow stars, for example, represent the main islands that comprise this country. 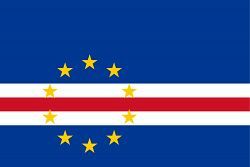 The blue represents the sky and the ocean, the red represents the effort of the people of Cape Verde, and the white represents its state of peace. This flag design was developed by the Movement for Democracy in 1991, when Cape Verde became independent of Guinea-Bissau and removed itself from the pan-African political movement. Prior to achieving independence from Portugal, this country utilized the flag of Portugal at official events. After its independence in 1975, Cape Verde adopted a different flag design that utilized the pan-African colors of yellow, red, and green.